Today's post comes to us from Mark Rosenstein. Dartfishes (Ptereleotridae) are a family that includes some attractive fishes. 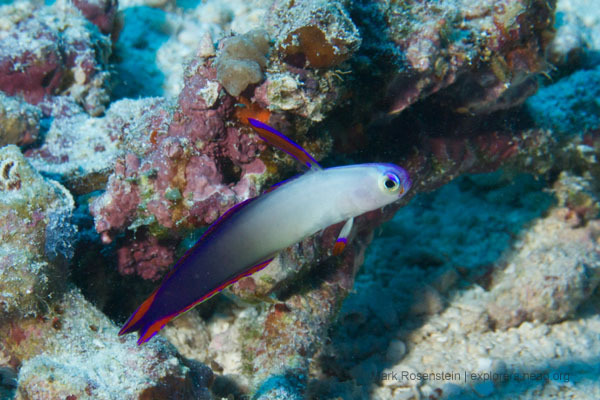 Fire dartfish, Nemateleotris magnifica, are common on sandy bottoms near reefs throughout the Indian and Pacific oceans. These fish are also seen in hobby aquariums. A closely related fish, the decorated dartfish, Nemateleotris decora, is similar except for the striking purple color. However, it is found much deeper, typically below 90 feet so is not seen very often. 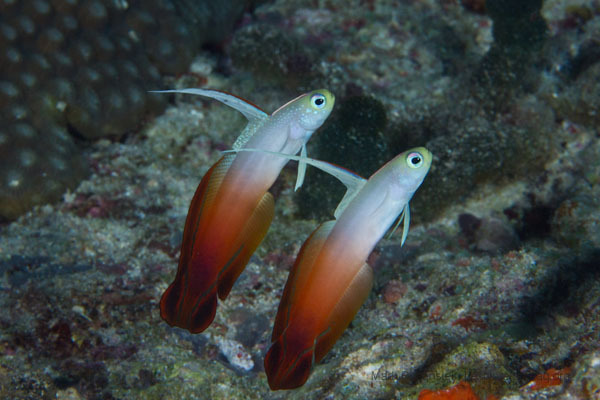 A third member of this genus, Helfrich's dartfish, Nemateleotris helfrichi, has a different color pattern and is found even deeper and is quite rare. and I both went down to that depth. While suffering a bit from nitrogen narcosis because of the depth, we thought we were seeing our target fish, and I snapped a few pictures. However, on reviewing the pictures later on the boat, we discovered that what we had found wasn't Helfrich's, but juvenile decorateds instead. On this trip we decided to make a third attempt. The divemaster reported that recent trips have seen just one individual at only 100 feet of depth, in a sandy patch that should be easy to find. We made a beeline for this area at the start of our dive on White Wall at Wakaya Island. Scanning the sands, we saw both fire and decorated dartfishes. Then Joe, one of the dive guides, waved us over. 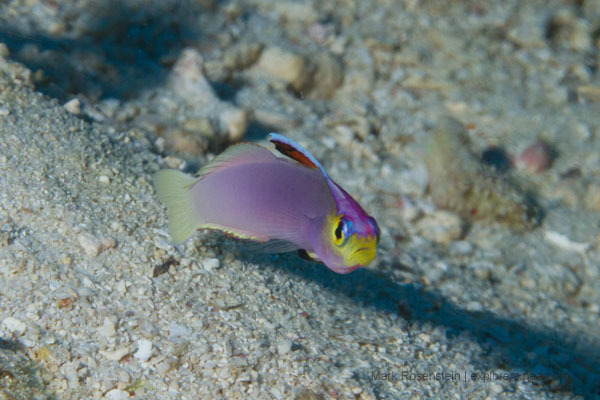 There was the Helfrich's dartfish, with a lavender body and yellow head stripe. I made sure that Bailey got a view of the fish as I inched closer and closer trying to get a good photo. After snapping 5 or 6 pictures, I got too close and the fish did disappear into its hole. But we got our sighting. Review back on the boat confirmed that this was what we were looking for and I managed to nail one of the photos. Three attempts really wasn't that much to find a seldom-seen fish. If only every species we wanted to see could be found that easily. Mark has had luck finding other rare fish on his life list. Just check out this post from a previous expedition to Fiji! The decorated dartfish also makes an appearance.